The story is baked into our culture. In a time of great peril, the parents of an infant child set him adrift to keep him out of harm's way. Eventually, the baby is discovered by a different set of parents, and when he grows up, he becomes a beacon to his people, protecting them from the evil powers of the world. The only question is, are we talking about Moses or Superman? The Man of Steel is a character intrinsically rooted in the Jewish tradition, and it's not a coincidence that he's been fighting Nazis since the very beginning. In 1933, Jerry Siegel and Joe Shuster were just high-schoolers when they first came up with a character named "Superman," and there is no doubt that they drew on their shared background as the children of Jewish immigrants in their conception of the character who eventually became the most popular superhero on Earth. There's the obvious Moses analogy of a baby strapped in a vessel and sent with nothing but a hope and a prayer to a better life, but the parallels run deeper than that. Superman is the embodiment of the American dream (or should we say "truth, justice, and the American way"), but he's also a perpetual outsider, somebody who's able to see the best and the worst in humanity thanks to his extraterrestrial perspective. In other words, his is a classic immigrant tale, told with unbelievable powers and whiz-bang enthusiasm. So maybe it's not surprising that Superman was rarin' to fight Nazis in 1940 — a lot more rarin' than Uncle Sam was, anyway. Hitler had kicked off World War II in September of the previous year, but the U.S. at large was still a little uncertain of if they should get involved or not. In 1939, after all, the Nazi-sympathizing German American Bund was able to fill Madison Square Garden. But Siegel, Shuster, and Kal-El wouldn't stand for it. In "How Superman Would Win the War," the Man of Steel took all of two pages to (literally) tie up the Nazis' frontline guns, punch all their planes out of the sky, gather up the Führer and his buddy (at the time) Josef Stalin, and present them to the League of Nations to answer for their crimes. That was only the beginning of Superman's Nazi-punching career. Once the USA did get involved, he doubled his efforts in propaganda publications to support the war — publications that, ironically enough, often ventured into blatantly racist depictions of Japanese people. Even after the war ended, he had a habit of running into Hitler or Hitler proxies, whether that made any sense or not. 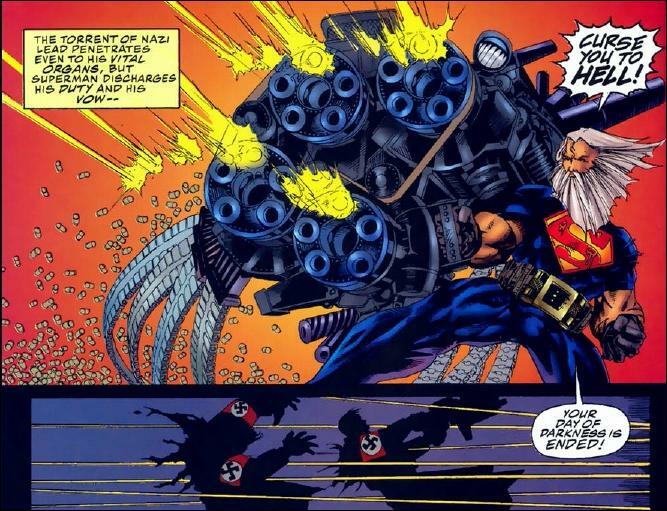 For a prime example of "not making sense," check out an elderly Supes fighting a pair of Hitler clones in 1995 with a gun the size of a Mini Cooper (consider yourself warned of exactly what this picture is). Drawing pictures of genocidal maniacs having their blocks knocked is one thing, but actually bringing the fight to real-life racists is another. But by now, you should know that immigrants get the job done. Superman is perfectly capable of leaping off the page and taking the KKK head-on. The Superman radio serial was going strong when World War II ended, but with the Nazis vanquished, they needed a new villain. Enter Stetson Kennedy. When a bad back kept him from the war effort, he determined to fight injustice at home by infiltrating the Klan and stealing all of their secrets. He then took their passwords, secret handshakes, and even the names they called themselves ("Grand Dragon?" Come on, guys) and gave them to Superman's writers. Besides playing the villain to the Last Son of Krypton, the Klan was painted in a ridiculous light on the show, and it had a real effect on membership. According to one story from that era, a Klansman finally saw the light when he saw his son playing the part of the no-good racist to be defeated by Superman. It just goes to show how fighting racists is as American as apple pie and heat vision. Want to find out more about how Superman fought against hate and prejudice? Check out Richard Bowers's "Superman Versus The Ku Klux Klan."